Welcome to Down On The Street, where we admire old vehicles parked on the streets of the Island That Rust Forgot: Alameda, California. Here's an 86-year-old Ford out on a food run to the Japanese takeout joint in my neighborhood. 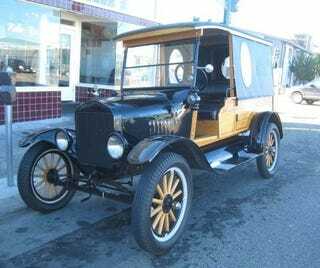 This isn't the first Alameda Model T in this series; we've seen this '19 Touring and this '24 Tudor. I talked to the owner (the guy on the right) and he says the car gets plenty of driving duty around town. No, it doesn't have to be started with a crank; newfangled electric starters came standard on the '24 Ts.